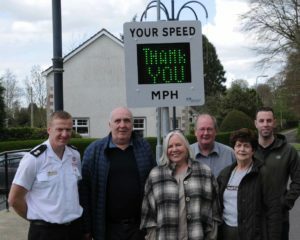 Fermanagh and Omagh Policing and Community Safety Partnership (PCSP) have recently taken delivery of a portable Speed Indicator Device for use across the district to help address the issue of excess speed in the Fermanagh and Omagh district. By using the portable speed detector in Road Safety Campaigns, it is hoped that the device will help educate the public about speeding in areas where there is concern for Road Safety by changing driver behaviours and consequently reducing driver speeds. “During 2017 six people lost their lives on the roads in the Fermanagh and Omagh District. Road Safety remains a number one priority for the PCSP and we will continue to promote a number of initiatives to ensure that there are no further deaths on our roads. The device captures and monitors vehicle speeds at the location where the sign is deployed. The sign indicates the speed of the oncoming vehicle and issues a warning to drivers to slow down if the speed indicated exceeds the speed set on the device. For further information on Fermanagh and Omagh PCSP, please contact Fermanagh and Omagh District Council by telephoning 0300 303 1777 (all calls charged at local rate).